I am obsessed with the Miu Miu Belted Ankle-Wrap Ballerina Flats. Ever since they came out, I wanted a pair. At $675, it is a little more difficult to click on the ‘Check Out Now’ tab. I do not like spending a lot of money on everyday shoes because they deteriorate much faster with each wear, unlike handbags. As I contemplated purchasing a pair, in the back of my mind, I kept thinking…look at Forever 21. You will not believe what I found. I ordered a pair in almost every color. 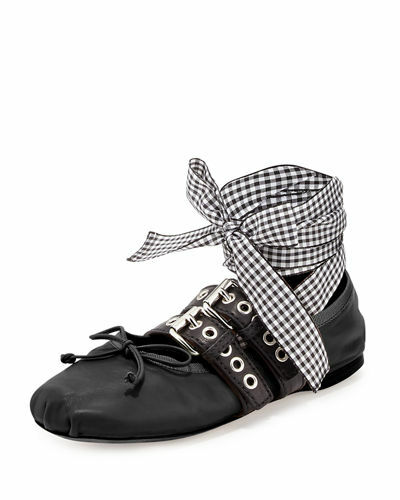 The shoes are very comfortable, and they come with both the black satin laces and the gingham print laces.